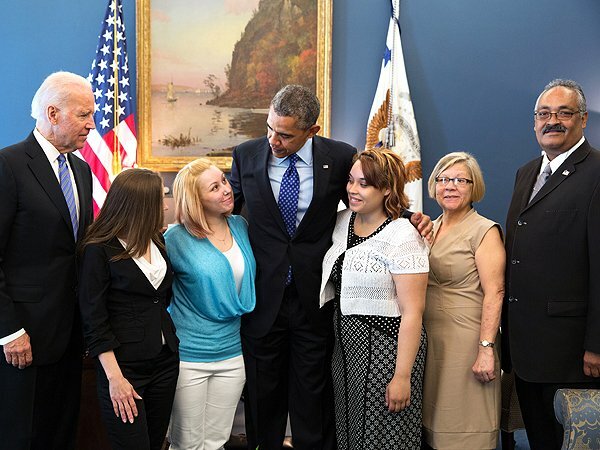 Cleveland house of horrors survivors Amanda Berry and Gina DeJesus met with President Barack Obama and Vice-President Joe Biden last month at the White House. Gina DeJesus, 24, said she particularly liked talking to VP Joe Biden because he was “very down-to-earth”. She added that she appreciated how much time VP Joe Biden, a longtime advocate of ending violence against women, spent with them and their families. Amanda Berry and Gina DeJesus visited the White House with Amanda’s older sister Beth Serrano and Gina’s parents. While the two women were meeting with Joe Biden in the West Wing, President Barack Obama swung by to say hello and the group snapped a picture. The family trip to D.C. was paid for by the National Center For Missing And Exploited Children and marked the girls’ first flight. Amanda Berry and Gina DeJesus were also treated to a salon visit and a shopping spree.